WWE returned to the O2 Arena for the second straight day as SmackDown was taped in London tonight. - Daniel Bryan opened the show by doing an in-ring interview with Renee Young. That led to Big Cass coming out and insulting Bryan, but Bryan beat him down, applied a submission, and wouldn't let go until after referees and other officials came out. Big E hit a spear on Sheamus to the outside and Woods pinned Cesaro with an elbow drop. 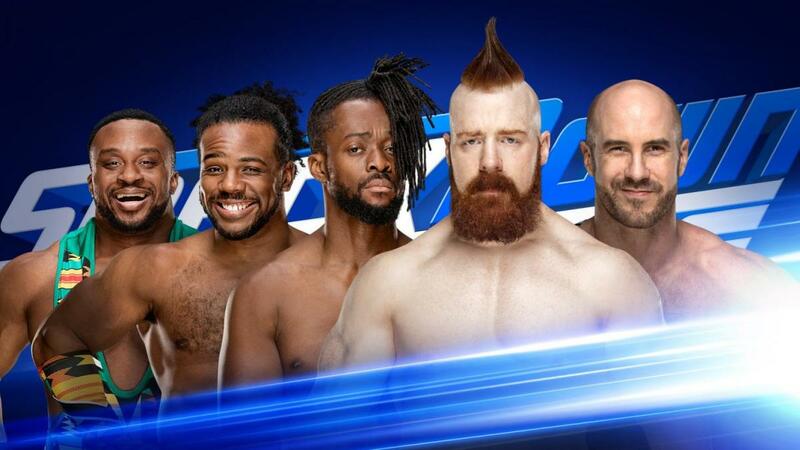 One of the New Day members will be added to the men's Money in the Bank ladder match. - A Bludgeon Brothers video aired. - Paige was confronted by Mandy Rose and Sonya Deville backstage. Becky Lynch vs. Rose vs. Deville in a Money in the Bank qualifying match was announced for later in the show. - AJ Styles cut a promo where he promised to beat Shinsuke Nakamura in the main event. Vega cut a heel promo hyping up Almas following the match. - In a backstage segment with Rusev, Aiden English, and Lana, it was revealed that Lana will be in a Money in the Bank qualifier against Billie Kay next week. - Carmella came out for her "Royal 'Mellabration." It resulted in Paige announcing Carmella vs. Asuka for the SmackDown Women's Championship at Money in the Bank. Carmella bailed after Asuka entered. - Shinsuke Nakamura did a promo, also promising to win in the main event. Lynch submitted Rose with an armbar. - Big Cass vs. Samoa Joe in a Money in the Bank qualifier is set for next week. Joe cut a promo on Cass, and The IIconic's did a promo about Kay's qualifying match with Lana. - Ronda Rousey will be wrestling at Raw's house show in London on August 29th. This was said to be very good. Nakamura won with the Kinshasa after a distraction where he faked a low blow.